A ruffled sweater is an adorable addition to any wardrobe. Feminine ruffles add just a little bit of fun to a casual, everyday look. Get the Look: Celeste is wearing the Fiesta Forever Sweater (S), Take Me Out Denim (5), and Step To It Shoes (Black). A ruffled sweater is great for vamping up any outfit. Create a more sophisticated look with coated denim and some fun flats. Get the Look: Celeste is wearing the Fiesta Forever Sweater (S), Dare to Be Different Coated Denim (S), and Comfort Calls Flats (Leopard, 7.5). The beauty is in the details. A ruffled sweater is much more exciting than a basic, plain sweater! Add your favourite accessory for a more polished look. Get the Look: Celeste is wearing the Fiesta Forever Sweater (S), Head Turner Denim and Turn Back Time Wristlet (Natural Plaid). Get an on-trend look with a ruffled sweater. 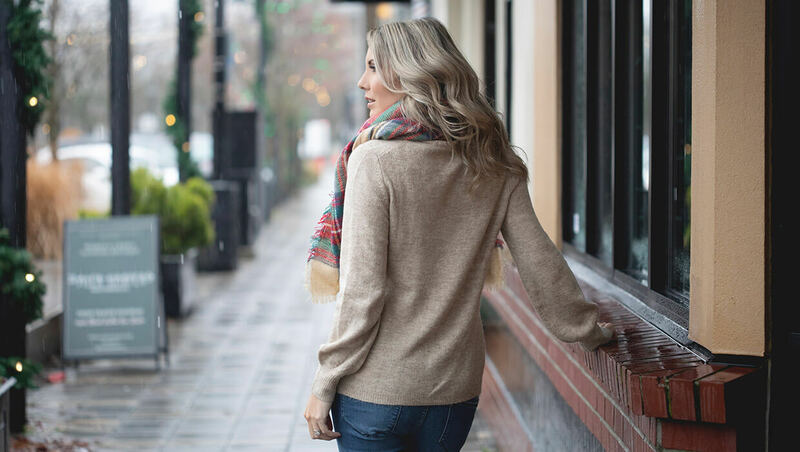 We’ve styled our Ruffled Sweater looks with the Fiesta Forever Sweater.